Every Raypak heat pump comes standard with a Titanium heat exchanger. 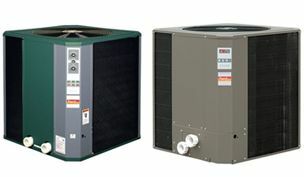 The Classic Series heat pumps have been designed to meet the exacting needs of the pool and spa professional. Raypak offers a heat pump which provides rock solid performance at an affordable price. The best way to size a heat pump is to multiply the surface area (avg Length x avg Width) by the desired temperature rise multiplied by 12. Click here to correctly estimate the cost of operating a heat pump for your pool.